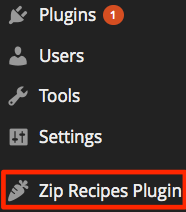 It’s easy to get started with the Zip Recipes Plugin. Simply install the free WordPress plugin and then we’ll walk through how to use this helpful tool below. 2. Go to Plugins page by clickin Plugins on the left navigation menu. 3. Then click Add New button at the top (next to Plugins heading). 4. In the top right search box, enter the text Zip Recipes and hit Enter key on your keyboard. 6. When the Plugin Installed Successfully message appears, click Activate Plugin. 7. Congrats! You’re ready to go. Now, let’s create your first recipe. 3. 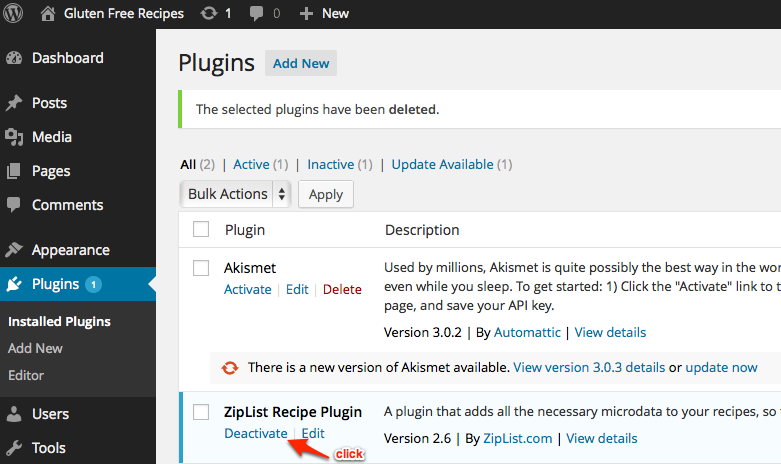 Click Deactivate under ZipList Recipe Plugin. 4. Now go to Installing the Zip Recipes Plugin and follow the instructions to install Zip Recipes Plugin. 3. If you are adding a recipe that has a secondary recipe, maybe for a sauce or a glaze, pay special attention. Add ingredients for the main recipe, then start the next line with an exclamation point to create a label, like !For the Sauce. Then, add the ingredients for the secondary recipe. 4. Next, if you scroll down, you can also click “More Options” to enter more details, like rating, prep time, cook time, serving size and yield. Click the “Add Recipe” button when you are done. 5. If you need to edit your recipe after you’ve clicked “Add Recipe,” simply click the spoon and fork icon again on the visual editor toolbar. When a recipe is inserted in a post, you will see an image like the one below where you enter post details, but again, to make edits to a recipe, click the spoon and fork icon on the toolbar. 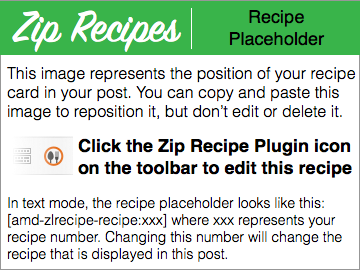 You can no longer edit or delete a recipe by clicking the placeholder image below. 6. 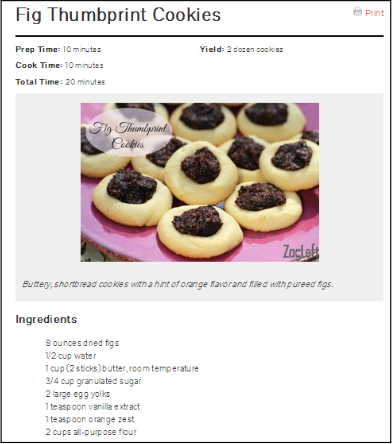 Using the Zip Recipes Plugin, here is what a recipe looks like on a blog. Even better, here’s what the recipe will look like in Google search results. Just like the big recipe sites, such as AllRecipes.com and FoodNetwork.com, your recipes can also show up in the Rich Snippets format within Google Recipe Search with a photo, ingredients, cook time and ratings. Click here to learn how to add links. Click here to learn how to add images to your recipe. Click here to learn how to create multi-part recipes. Click here to learn how to format your recipe text. 2. 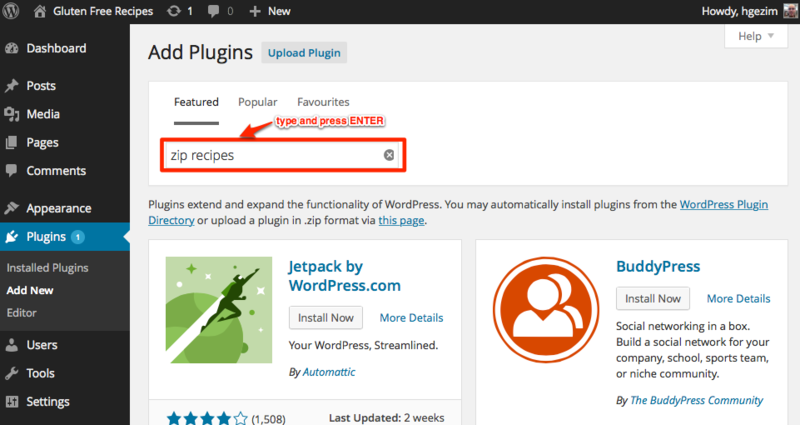 This will open a page called “Zip Recipes Plugin Settings,” and from here you’ll be able to customize the output of your recipe plugin in several ways. Let’s take a look at each. If you choose to make any changes, be sure to click the blue “Save Changes” button at the bottom of the page when you are finished. 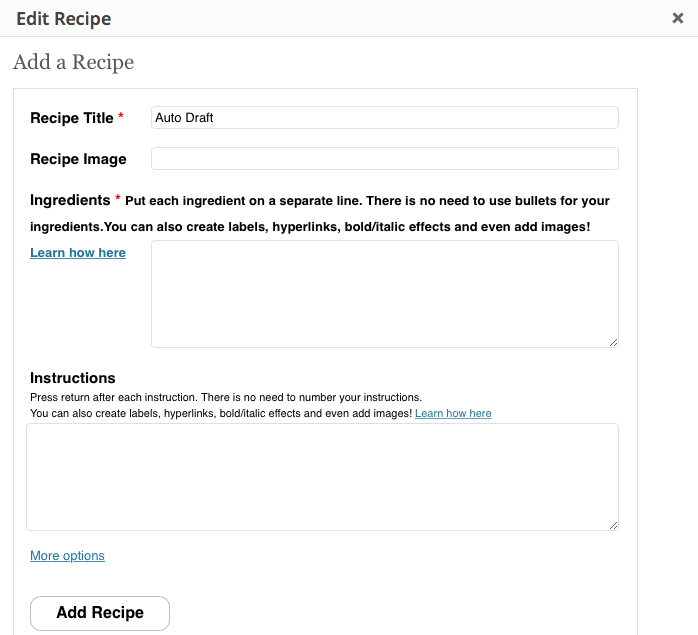 Any changes you make here will be reflected across all recipes posted on your site using the Zip Recipes Plugin. 3. Custom Print Button. If you changed the look of the Print button (or plan to do so), you’ll need to enter the image URL for the custom button in the space provided. If you plan to use standard Print text link, just leave this field blank. 5. Printed Output: Recipe Permalink. If you leave this box unchecked, the URL for the specific recipe post will appear at the very bottom of the print version of the recipe. 6. Printed Output: Copyright Statement. Here you have the opportunity to enter a copyright notice, the URL for your blog, or anything else you’d like to see appear at the bottom of the print version of your recipe posts. 7. In the General section, you’ll see Stylesheet. Only uncheck this box if you or a designer are working on a fully customized stylesheet to use with the recipe plugin (most plugin users will leave this box checked). 8. Recipe Title. If you leave this unchecked, you will see a title in the main body of your post. If you check the box, the black title to the left of the “Print” button below will disappear. The title will continue to appear on the print version of your recipes. 9. Print Button. 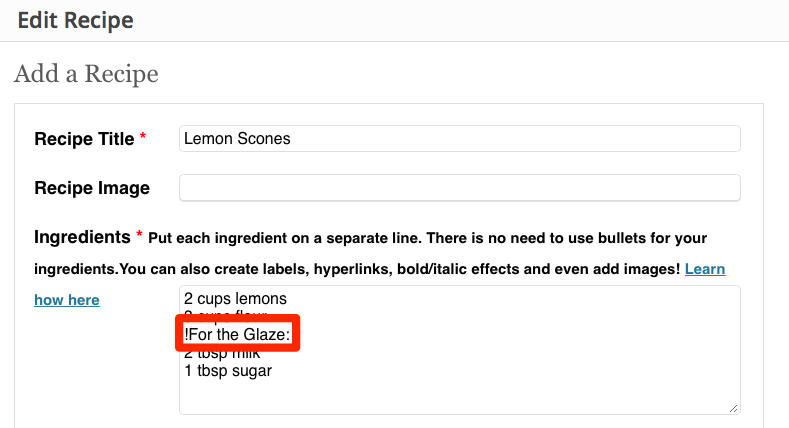 If you leave this unchecked, you’ll see a “Print” button to the right of the recipe title, enabling your readers to print out your recipe as a recipe card. 10. Image Width lets you set the appropriate size to match the width of your blog post. All of your recipe posts will size photos the same way based on this setting. 11. Image Display has two options. First, check the “Don’t show image in post” option box and the image will not appear in your blog post. It then has the potential to be picked up by search engines like Google and Bing. Second, leave “Don’t show image in print view” checked and the recipe image will not appear when users print out your recipe. 12. Border Style. Here you have the opportunity to add a solid, dotted, dashed, thick solid or double black line around the entire recipe. The default is set to none if you do not wish to have any kind of border around your recipe. 13. Ingredients and Instructions. Here you have the option to change the label (e.g., if you prefer to refer to “Instructions” as “Directions”) or hide the label altogether by checking the “Don’t Show” boxes. Additional options include how the information is displayed: bulleted list, numbered list, etc. 14. In the Other Options section you’ll find options to change labels for rating, cook time, yield, notes and more. These are all optional so you don’t need to include any of them in your posts. However, if you want your posts to show up in Google Recipe Search in the Rich Snippets format, you will need to include at least two of the following fields: prep time, cook time, total time, calories, rating and/or image.